Ruby tutorial for Guaranteed quick learning, Ruby guide with many practical examples, Ruby book covers widely used concepts required to build real-life projects. 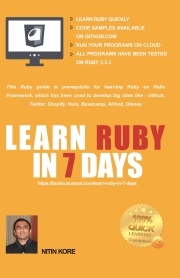 Description of "LEARN RUBY IN 7 DAYS"
Ruby is a pure object-oriented and open source programming language that supports all kind of platforms including Windows, Mac OS and all versions of UNIX. Programmers willing to learn Ruby on Rails framework should first learn Ruby. They could treat this book as a guide and prerequisite before start learning Ruby on Rails framework. Many popular websites like Twitter, Shopify, Airbnb, Hulu, Basecamp, Disney, and GitHub have been developed using this framework. There is a lot of demand for people experienced in Ruby. Nitin Kore is the Founder and CEO of KORESOL SOFTWARE LLP and has formerly worked with many MNC's like Infosys, TCS, Cognizant, Polaris, and CMC before starting his own company KORESOL. He has completed his Bachelor of Engineering (B.E.) from COEP - Pune University. He has about two decades of experience in the field of Information Technology. He also has a vast experience in serving many Fortune 500 clients like Citibank, Fidelity, S&P, BNY to name a few. Nitin always had a vivid passion to give back to the society, and this passion led him to come up with this quick guide for Ruby programmers that would help them understand the widely used concepts in Ruby. These concepts are also important for anyone who wants to learn Ruby on Rails framework. The Internet of Products by Qliktag Software Inc. Reviews of "LEARN RUBY IN 7 DAYS"